Looking for a new mobile game to try this weekend? Check out a few of the games that launched this week on mobile devices. 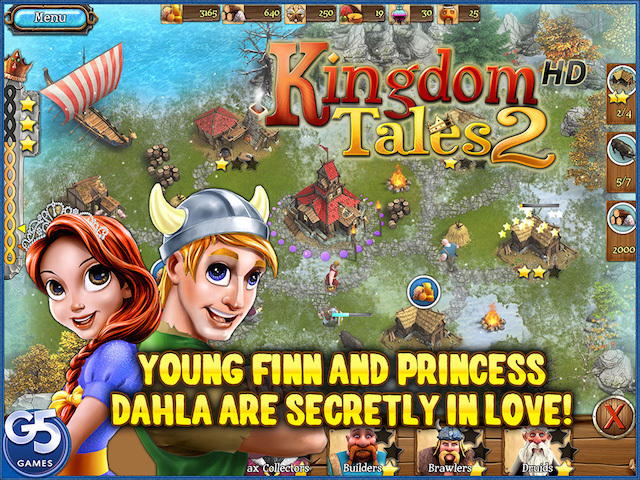 Kingdom Tales 2 (Free demo, $4.99 / $6.99 full game unlock on iPhone / iPad) – This latest game from G5 Entertainment is a time management title, challenging players to help a young blacksmith named Finn complete city-building tasks in order to prove himself worthy of the princess’s hand in marriage. Kingdom Tales 2 offers 40 levels across nine locations, with three difficulty settings to choose from. The full game unlock is on sale for $2.99 / $4.99 on iPhone and iPad, respectively, through March 20. Four Letters (Free on iOS, Android) – This word game from publisher PikPok challenges players to create as many four-letter words as possible while racing against the clock. Players are presented with groups of four tiles at a time, and are asked to create a single four-letter word before moving onto the next set of four tiles. For instance, when given the letters “AYCH,” players would need to quickly spell “achy” in order to move on. In some cases, multiple words may be possible, but gamers only need to create one with the letters provided. Players receive bonus time for each correct word, and the game ends when players run out of time. Power Rangers: Unite (Free on iOS) – Originally announced in January, Power Rangers: Unite from FTX Games (formerly Funtactix) challenges players to defeat the evil Nerodark, who has created an army of “villains from the shadows” to do his bidding. In the game, players will complete card battles using characters spanning the entire franchise, with both a single-player campaign mode and multiplayer battles being available. Gamers can collect over 250 different cards, representing Rangers, as well as Zords, weapons and special abilities. New cards and single-player battles will be added to the game in future updates. Mr Jump (Free on iOS) – From 1Button, Mr Jump is a simple, one-button game, asking players to tap or tap-and-hold on the screen to cause Mr. Jump to jump and avoid obstacles like spike traps and pits. A player’s progress is measured by level complete percentage, their number of jumps, and the number of level attempts. Stats can be shared out to Facebook and Twitter. Stormblades (Free on iOS, Android) – From Kiloo and Emerald City Games, Stormblades is a sword-fighting game, challenging players to complete a warrior’s rite of passage and fight legendary “Keepers” in order to prove their worth. Players swipe or tap on the screen to attack or defend against enemy attacks, with the direction of the swipe determining how their character attacks or moves in the environment. Players earn up to three Relics (think stars) on each level, and can upgrade their weapon to make their warrior stronger over time. Patchmania (Free on iOS) – This puzzle game from Little Details asks players to lead a bunny named Calvin on a quest for revenge against Farmer Lester, who has destroyed Calvin’s forest home. The game features over 600 puzzles, asking gamers to drag a line across crops in order to connect them all with a single line, before reaching the exit hole. As players progress, additional forest critters, and matching crops, are added to levels, increasing the challenge. Players can use hints if they’re stuck. KromacelliK ($0.99 on iOS, Android) – From Wild Team and BulkyPix, KromacelliK is a platformer set in a dark world, challenging players to help a microorganism navigate its environment by stretching, expanding, bouncing and squeezing cells, which can be used as weapons, until they reach the exit point. Players will need to avoid obstacles in each world, such as mines and viruses. Ambush – Tower Offense (Free on iOS) – This strategy game from Zillion Whales offers both tower offense and tower defense gameplay, as gamers work to be the best ruler around by constructing their kingdom, upgrading their towers and units and leading assaults on other players (or defending their own kingdom from attacks). The game’s tower defense mode is standard, allowing players to build and upgrade towers to defend lanes from oncoming invaders, while the tower offense gameplay allow users to take their own military units into battle against others’ defenses. The game offers 20 tower types and upgrades, as well as 20 battle units and enemy monsters, each with different stats or skills. Placemino (Free on iOS) – This puzzle game from Gameluck Studio asks players to drag shapes to a game board in order to create complete horizontal lines, causing them to disappear (like in Tetris). Any leftover dots remain in place, rather than falling down the screen, so players are encouraged to create as many lines as possible, without forming gaps, until they eventually run out of moves.